Turns out, JVC Kenwood isn't the only one that can do wireless Android Auto. 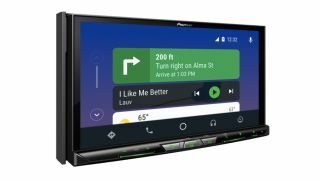 And, in fact, Pioneer Electronics is doing it one better by adding wireless Apple CarPlay support to its latest in-car units, too. Pioneer's new receivers – the AVIC-W8400NEX, AVIC-W6400NEX and AVH-W4400NEX– are now official after an initial tease at CES 2018. In addition to the traditional wired connection to your smartphone via USB, the units, which range in price from $1,200 for the W8499NEX to $700 for the W4400NEX, are able to pick up what your phone is beaming out without a wired connection. W8400NEX, the flagship in the series, features a 7-inch capacitive display. Moving down the line, the W6400NEX houses a 6.2-inch clear resistive display, and the W4400NEX, though its display stretches to seven inches, is also a resistive touch screen. In addition to making phone calls and playing music for you, the receivers will listen to your commands via Google Assistant and Siri, according to Engadget. With the voice assistants in your control, you can do everything from control lights in your home to adjust your thermostat before you even step in the door. At the moment, Android Auto Wireless is only supported on the Google Pixel, Pixel XL, Pixel 2, Pixel 2 XL, Nexus 5X and Nexus 6P. Eventually, Android P and Android Oreo will bring further wireless support to more smartphones. More tech for your car: the best dash cam and best sav nav around! Like cars? Then check out our ongoing On The Road series!